Dalrymple Shire, an area of 68,388 sq km, larger than Tasmania, lay 130 km west of Townsville. It was bounded on the west and east by the Great Dividing Range and the Leichhardt-Seaview Ranges respectively. The rivers running through the former shire constitute most of the watershed of the Burdekin River which enters the Pacific near Ayr. In 2008 the shire was amalgamated with Charters Towers City to form Charters Towers Regional Council. As Charters Towers was a tiny hole (42 sq km) in a large doughnut, the external boundaries of the regional council are the same as the former shire's. At the north of the former shire is the Valley of Lagoons, a luxuriant landscape described by Ludwig Leichhardt on his expedition in 1845 which crossed the shire in a north-westerly direction. The Valley was taken up as a pastoral run in 1863 by George Elphinstone Dalrymple in partnership with Robert Herbert (future Queensland premier) and others. Dalrymple was a successful crown lands commissioner and an explorer, having organised an expedition to explore the Burdekin watershed in 1859. When Dalrymple took up the Valley of Lagoons the district had been thrown open for settlement for two years. 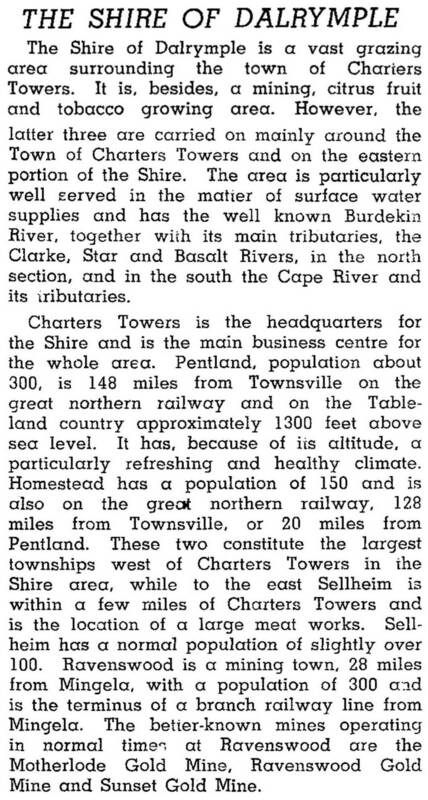 A police camp was established on the Burdekin, 40 km north of the (future) site of Charters Towers. The camp was surveyed as the district's first town in 1864 and in 1868 was named Dalrymple. 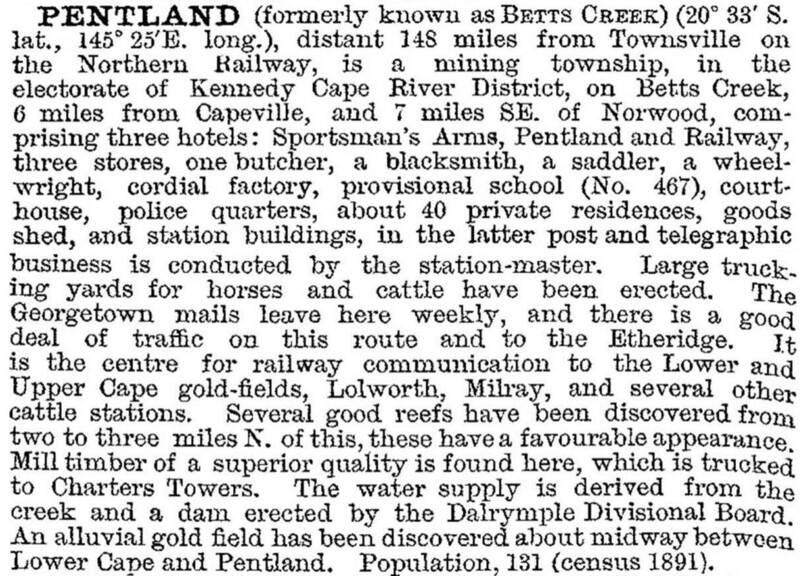 The district's pastoral economy diversified with the discovery of gold at Upper Cape River (1866), Ravenswood (1869) and Charters Towers (1872). When a local government division was formed in 1879 it was named after the district's first town and its most successful explorer. Charters Towers had been made a separate municipality two years before, and remained so, but functioned as the Shire's administrative centre. Ravenswood formed a separate local government division (1380 sq miles compared with Dalrymple's 28,000 sq miles), remaining so until 1929 when it was amalgamated with Dalrymple Shire. A railway from Townsville, running south-westerly across the shire via Charters Towers, was opened in stages during 1881-84. A branch line to Ravenswood operated between 1884 and 1930. Gold production effectively ended in Ravenswood in 1917 and in Charters Towers in the 1920s. Beef cattle grazing remained a struggling industry with low overseas prices in the 1920s, tick problems, intermittent drought and loss of condition when conveyed by rail or by stock route. A wartime meatworks at Pentland in the south-west of the shire helped the industry, when quantity rather than quality was wanted. Improved pastures, supplementary feeding and better breeding in the 1950s brought the industry up to a more profitable operation. In 1967 high grade nickel laterite was found at the former copper mining town of Greenvale in the north-west of the shire. In conjunction with the State government the private sector constructed a railway line from Cobarra (north-west of Townsville) to a newly built Greenvale township. Crushed ore was conveyed to a processing plant in Townsville (1974), by when about 200 employees were at Greenvale. Other modern mining ventures include Mount Leyshon open cut gold mines, 24 km south of Charters Towers, and the Thalanga zinc, lead and copper mine 65 km west of Charters Towers. The Greenvale mine closed in 1992, the railway was dismantled in 1997, and the town has converted to a modest tourist site. It has a hotel-motel, progress association and a school. The idea of damming the Burdekin River was advanced in 1889 and more realistically in 1949 when it was reported on by a Commonwealth-State Committee. In 1974 a minor weir was built and ten years later work began on a dam downstream of the Burdekin River falls. Completed in 1988, Lake Dalrymple holds four times the water in Sydney Harbour and is Queensland's largest water storage. It is used for both urban and irrigation purposes on the coastal farmlands. Shire residents and tourists use it for day trips and camping (Charters Towers supply is from a weir (1902) upstream of the falls). When Leichhardt explored the Dalrymple district he frequently noted the extensive basalt formations that are west of Charters Towers. The Great Basalt Wall was the last major volcanic activity in northern Australia. It is part of a 120 km lava flow, and includes Red Falls and Echo Hole. The western sector is a national park. Dalrymple Shire's major industries were beef cattle and mining. In 2001 they had 33% and 13% respectively of the shire's total employment. The shire's administrative and commercial centre was Charters Towers, so wholesale and retail employment in the shire came to just 12%. Education had 7% and accommodation and hospitality had 3% (again dominated by Charters Towers, although Ravenswood has two surviving grand hotels). During the 1990s, when municipal amalgamation was an unwanted possibility, the Shire and Charters Towers had some rewarding collaborations. The World Theatre entertainment centre (1996) was jointly funded, as was the purchase of the All Souls' and St Gabriel's schools when they faced closure by the Anglican church. The purchase was initiated by the longer-seeing shire chair (1973-2004), Peter Black. * 2277 male, 1088 female.